Most of us have made a potluck meal from time to time. I am sure some of those were lucky and some not so lucky. One of my lucky potlucks is my noodle potluck. It is quite simple to make. All you really need to do is cook a pound of spaghetti. While noodles are cooking, sauté some veggies in pan in olive oil. Once spaghetti is cooked and drained, add it to the skillet. Add soy sauce to the mixture to give the dish some flavor and color. I just gave the gist of the noodle bowl potluck because you really can customize it any way you want. 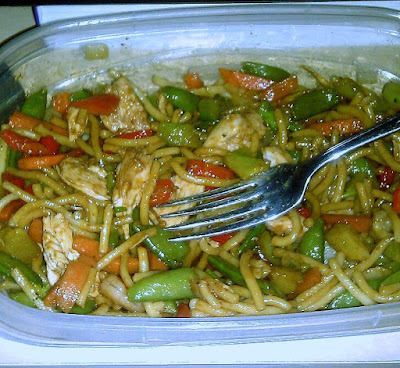 I had a bag of frozen veggies and some left over chicken that I used for the noodle potluck seen in the picture.